Almay Makeup Remover Pads only $0.47! 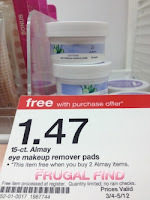 Hurry over to Coupons.com to print this new Almay makeup remover coupon. Bring it to Target to score a great deal! Thanks for deal and photo, The Frugal Find!